Two years ago, I had the privilege of writing an article regarding artist residencies at Blake. In it, I described the myriad of ways in which the Arts teach each of us to observe the world around us, critically perceive others' stories and communicate our own voice. In the Arts we find connection, collaboration, choice with intention, public vulnerability, risk and revision - enduring skills that undergird not only all arts, but all human interaction. At Blake, we are privileged to work with a broad array of artists and the many lenses they offer into the world. In alternate years, the McGuire Visiting Artist Residency enables the Blake community to work with a professional artist to "bring the outside arts world into the classroom." Projects explore interdisciplinary connections, meld the artist's themes with student ideas and engage the entire Blake community through special exhibits or installations. Whenever possible, we purposefully select artists who stretch our viewpoints and introduce us to disciplines not typically offered in our Blake art classes. 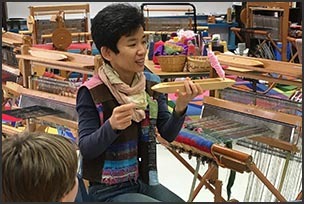 Our 2015-16 McGuire Artist-in-Residence, Chiaki O'Brien, is an expert in Japanese SAORI weaving. This year she is working with students on our Northrop, Blake and Highcroft campuses. SAORI is a contemporary hand weaving style founded by Misao Jo in 1968. It is a free-style weaving without any rules or restrictions of what or how to weave. The "SA" of "SAORI" has the same meaning as the first syllable of the Zen world "SAI." It means everything has its own individual dignity. "ORI" means weaving in Japanese. SAORI weaving is not merely the act of weaving a piece of cloth; it is an attempt to identify our true selves. 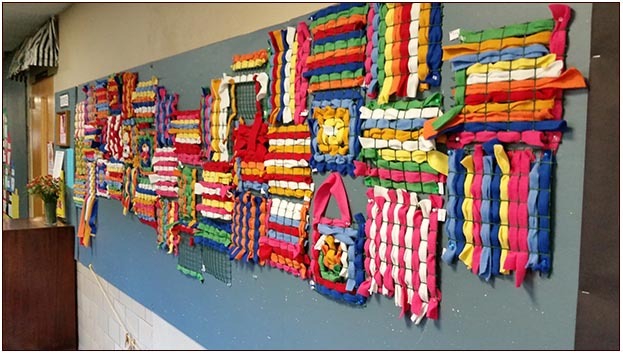 SAORI weaving unites many skills and attributes that we prize in Blake students: collaboration, individual choice, risk, resilience and personal expression. When unintended outcomes occur in the SAORI process, they become unique elements of the piece being crafted, and the weaving continues. Brian Sago, Upper School Visual Arts Teacher, asked Chiaki, after a student had left, if a stray thread "was a mistake" and Chiaki shot down the word instantly with a story about a submission to the State Fair where she was criticized for leaving some loose strands at the fringes. She "lost four points." The conversation demonstrated a lot about her character and personality. At the Northrop campus, Chiaki and the student curatorial committee transformed the Martha Bennett Gallery into an interactive classroom, with eleven looms set about the space. Throughout Chiaki's Upper School stay, the gallery remained open so the entire community could weave whenever they wished. 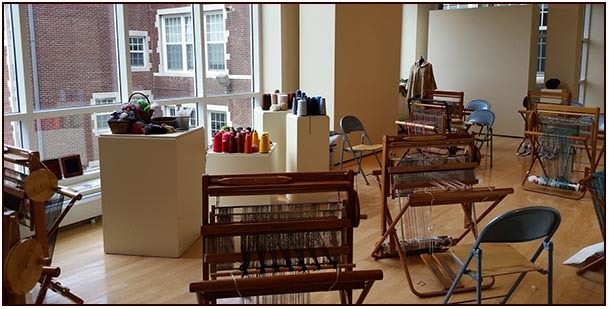 As the weeks progressed, communal works were lifted off of the looms and hung about the gallery. Across various classes, students investigated everything from design and operation of the loom to the chemistry behind mixing and utilizing handmade dyes for use with natural fabrics. Chiaki's Upper School residency culminated with a gallery show, The Living Loom. The exhibit showcased some of Chiaki's own artistic creations in addition to those created during her residency. Interactive "living" looms continued as the highlight of the show, giving guests an opportunity to experience spin colors of their choice and then weave them into the works in-progress at each loom. As Upper School students enjoyed time with Chiaki, Lower School Blake Campus artists prepared for their visits with her. Weaving filled the Lower School, with studies of patterns, textiles and how to use small pieces to build larger ones. Chiaki completed two weeks in residence at the Lower School Blake campus, where she worked with all students across all grade levels. Lower School teachers Kim Lane, Kris Nelson and Chiaki transformed the Lower School art room into an interactive space, similar to the setup in the Upper School's Bennett Gallery. PreK students experienced the looms in their home space. Again, weaving produced bountiful connections and beautiful community pieces. Preparations for Chiaki's visit to the Highcroft campus are in full swing. There are open looms swinging from the ceiling of teacher Jackie Quinn's art studio. And looms of various materials stand ready for weaving. 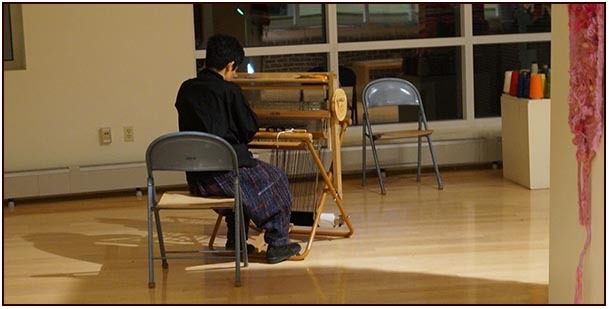 As part of Chiaki's residency, Blake invested in two SAORI looms, and plans are underway to purchase a third so that one loom may reside permanently on each campus. 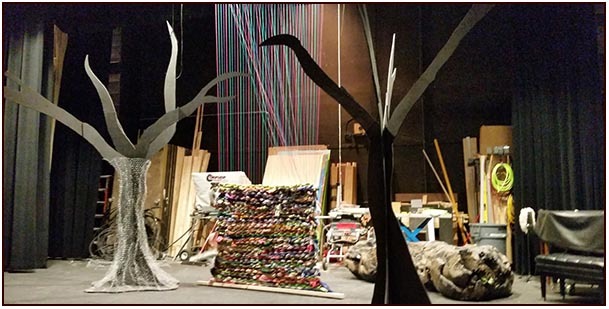 You will even find a temporary loom installed on the stage of the MacMillan Performing Arts Center as part of the set for the Middle School play Women Who Weave by Jessica Puller. "This is FUN!..So relaxing...Soothing...Therapeutic...This is better than TV...I can sacrifice recess for this...This is my favorite thing we've ever had in the gallery...Can I buy one for my house?"